Welcome to My Old Phonograph website. This site was created for those who are new to the antique world of VIntage Spring-Driven Gramophones, Victrolas, Talking Machines and Phonographs. 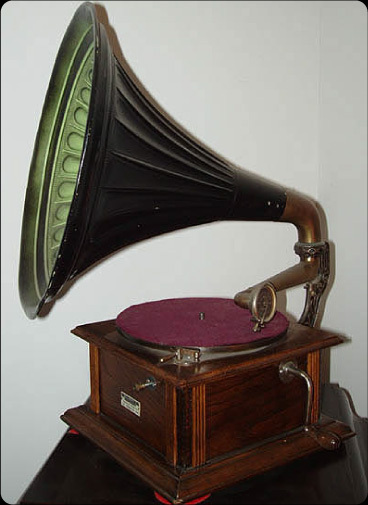 This website is to help you, the beginner, get to know the gramophone/phonograph, its parts, how to familiarize yourself with what is a reproduction and what is authentic. 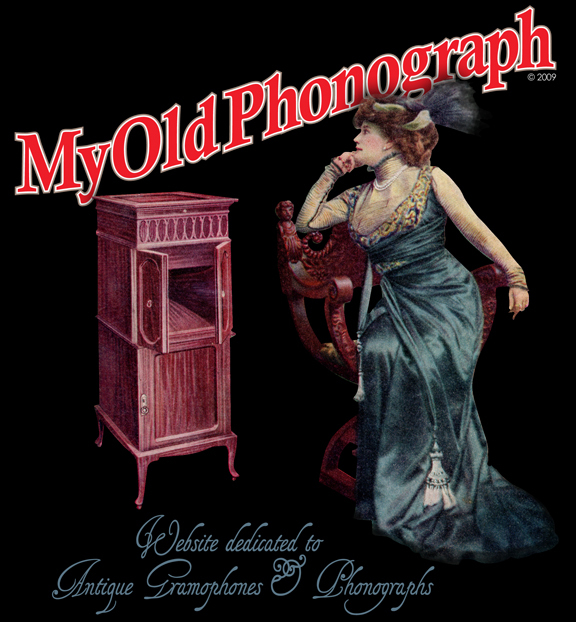 Think of this site as a beginning course to Antique Phonographs. This website is an ongoing project, so most pages will be updated when time allows. collectors and enthusiasts all over the world since 1991! The brand is Chamberlain Phonograph Needles. Located in St. Paul, MN USA. Patented "Siren" Spear point Phonograph Needle available on the NEEDLES link. meant for one use and then discarded. Click here. PHONOGRAPH NEEDLES for your old Victrola style phonograph! We ship worldwide. NEW High Quality Nickel-Plated Steel Phonograph Needles... Made specifically for Victrolas, Gramophones & early-time Flat Disc phonograph Records. Made with pride in the USA. They can be used on your antique 1900's model phonographs such as: Victor Talking Machine, Columbia & Grafonola, Silvertone, His Masters Voice (HMV), Vocalion, Brunswick, Sonata, United, RCA Victor, Berliner, Bandmaster, Paramount, Starr, Aretino, Gilbert, Regal, Baby, Blue Bird, Cheney, Chicago Phonograph, Standard Talking Machine, Genola, Zemerphone, Thorens, Olympia, Reginaphone, Standard A, Oxford, Zon-O-Phone, Edison-Bell, Decca, Sonora, Klingsor, and many many more... that play standard flat 78's. NOTE: Never use old or rusted needles on your delicate old records. NOT FOR CYLINDER RECORDS, EDISON DIAMOND-DISC OR EARLY PATHÈ RECORDS Phonograph Information Website: Victor Talking Machine, Victrolas, Columbia, United, Edison, Starr, Sonora, Pathe, Brunswick, Records, Radio, Grafanola, Gramaphone, Graphaphone, Music, PATHÉ, Needles,Reproducers, Minneapolis, STYLUS, chamberlain phonograph needles for sale.